Baltimore Food Hub (BFH) will be a food incubator hub in a severely distressed area of East Baltimore. BFH will create 34 permanent full-time quality jobs and 80 construction jobs. By bringing a small grocery store to the site, BFH will eliminate a food desert. One-third of the Baltimore Food Hub’s square footage will be occupied by nonprofits (21%), and minority-owned businesses (14%). ACT has partnered with key leading community organizations that will contribute to the training of entrepreneurs and creating social events for the East Baltimore community. One of these partners, Urban Pastoral Collective, will develop a multicultural food hall with community/event space and office space for community-centric startups. 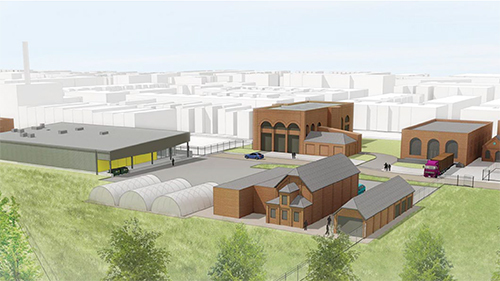 Nation Community Investment Fund provided $4.4 million in New Markets Tax Credit (NMTC) allocation to finance the creation of Baltimore Food Hub. Baltimore Food Hub (BFH) is located in a severely distressed area of East Baltimore, Maryland. BFH will be a food incubator hub, bringing together food entrepreneurs, producers, and retailers. The centralized food market will eliminate a food desert and will incorporate both teaching and commercial production kitchens. BFH will provide a space for food manufacturing, job training, an urban farming operation and an all-season market. American Communities Trust (ACT), the BFH project sponsor, is a Baltimore-based nonprofit that works through partnerships to create inclusive economic development projects that bring growth and prosperity to low-income residents. Since its founding in 2008, ACT has worked in more than two dozen U.S. cities helping clients engage low-income communities through projects that total in the hundreds of millions of dollars. The Harbor Bank of Maryland, opened in 1982, and now conducts general banking business in seven branch locations primarily serving the Baltimore, MD metropolitan area. The retail nature of the Bank allows for diversification of depositors and borrowers so it is not dependent upon a narrow base of customers. The Bank is also the first community bank in the country to have an investment subsidiary, Harbor Financial Services. As a CDFI, Harbor Bank invests in areas of the highest economic need.